For any variation of the dual port 1600 engine that has been increased in displacement up to 1835cc. Contains Single GENUINE Weber 44 IDF. The bitterness of poor quality remains long after the sweetness of low price is forgotten. REDLINE PREMIUM WEBER CONVERSION KIT. (1) 44 IDF Genuine European WEBER Carburetor (1) Intake Manifold (1) Linkage Kit (1) Air filter assembly with Washable/Cleanable element (1) Instructions. The WEBER conversions by Redline are unique in many ways. Redline was the first and is still the best conversion available. Proprietary changes to the jetting allow for flawless performance. Tuning and jetting from the leader in WEBER conversions - REDLINE. Factory Direct Pricing and Product Support. Largest selection of WEBER Carbs and parts. We sell only GENUINE EUROPEAN WEBER carbs - no substitutions. Beware of Chinese made and "NorthAmericanWebers" -they may look the same - but they are. The Redline kits contain only the Genuine Weber from Europe. Here is a link that really explains it well. Any variation on the 1600cc engine with dual port heads that might be in a trike, super-v, dune buggy, sand rail, etc. That has been increased in displacement up to 1835cc. Vehicles with AC and or Cruise may required additional modifications that are not available in this kit. Fabrication or reuse of original parts may be needed to allow the AC or cruise to work. Automatic transmission vehicles may require additional use of factory linkage for proper operation. NOT LEGAL FOR USE IN CALIFORNIA. Before ordering make sure to check with your state regarding emission laws. Legendary marques like Alfa Romeo, Aston Martin, Ferrari, Lamborghini and Maserati have been closely linked with the products of the equally legendary Edorado Weber S. Of more than 50 years. While various producers of racing and high performance induction systems have moved in and out of the limelight over many decades, Weber alone maintains its worldwide superiority. The foundation of Weber's supremacy is no mystery. It's nothing more than the traditional virtues of careful design, meticulous manufacturing standards and uncompromising quality control, coupled with that unique Italian attribute of elegance in design. Do not confuse this with WeberNorthAmerica - not the same company. Weber North America brands various carburetors as "WEBER's" under a licensing agreement but they are NOT the legendary Italian designed and European built WEBER. REDLINE uses exclusively the European WEBER carburetors in their conversions. REDLINE developed the IDF Series carburetors, for use in any performance environment. The complete IDF carbs include: Extended Emulsion Tube Holders and Adjustable, Spring-Loaded Accelerator Pump Actuating Rods. These IDF carburetors are tuned to Redline specifications. The Import Experts are not responsible for its products when subjected to abuse, improper installation, accident or normal wear. We sell only high quality replacement parts for cars, and trucks. Part of what has made us survive all those years is changing with the times, and providing HIGH QUALITY customer service. 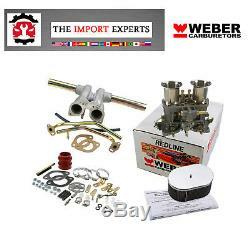 The item "Weber Carburetor Kit VW Bug & Type 1 with Single 44 IDF Tuned for VW K1316" is in sale since Sunday, February 18, 2018. This item is in the category "eBay Motors\Parts & Accessories\Car & Truck Parts\Air Intake & Fuel Delivery\Carburetors". The seller is "theimportexperts" and is located in Yakima, Washington. This item can be shipped to United States, Canada, United Kingdom, Denmark, Romania, Slovakia, Bulgaria, Czech republic, Finland, Hungary, Latvia, Lithuania, Malta, Estonia, Australia, Greece, Portugal, Cyprus, Slovenia, Japan, China, Sweden, South Korea, Indonesia, Taiwan, South africa, Thailand, Belgium, France, Hong Kong, Ireland, Netherlands, Poland, Spain, Italy, Germany, Austria, Israel, Mexico, New Zealand, Philippines, Singapore, Switzerland, Norway, Saudi arabia, Ukraine, United arab emirates, Qatar, Kuwait, Bahrain, Croatia, Malaysia, Brazil, Chile, Colombia, Costa rica, Panama, Trinidad and tobago, Guatemala, Honduras, Jamaica.